We get many calls to our office asking questions about CNC floppy emulator hardware. While we invite you to contact us for more detailed information, we want to answer the most asked question: Does your Floppy Connect hardware add memory to my machine? The answer is no, but don’t let this deter you! The benefit of floppy drive replacement hardware is not adding memory to your machine, but we will also touch on the subject of file sizes later. Refreshing, not replacing, legacy machines: Just because your machine still has a floppy drive does not mean it’s time to put it out to pasture, in terms of productivity! Using one of our floppy drive emulators will upgrade your machine and prevent you from spending thousands of dollars on a new CNC machine. 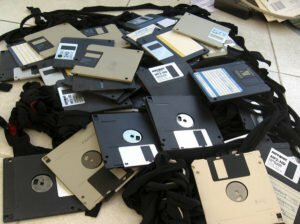 No longer hunting for obsolete storage media: Floppy disks have been extinct technology for several years now. Finding them new is hard to do and will cost you. Meanwhile, getting a USB stick is as easy as making a run down to a pharmacy, a big box technology store, ordering from Amazon, or buying one from Target and Walmart! 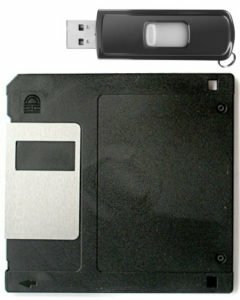 Remember, a 2GB stick is the largest size for the Floppy Connect, and it must be FAT formatted. Eliminate proprietary upgrades: Having a tech from the machine tool builder come down to evaluate your machines is expensive. It is also cost prohibitive to have them install their specific hardware to upgrade your machine. Our Floppy Connect is a small investment in comparison and works on a large number of controls, with the list growing daily. How many programs you can store on the USB stick is another big question we get. Since the customer is going from a disk that was once 720k or 1.4MB to a 1GB SFA USB stick, the assumption is that they can store and send big programs from it. This is incorrect. Program sizes for customers typically range from 1kb to 25MB. On floppies, program sizes can range from 1kb to 1.4MB. Let’s say your machine manufacturer made a floppy disk drive that could only handle DD (double density) floppy disks. This means it could only hold 720kb worth of storage, and could typically hold 110 machine program files on it. What if your machine could handle 1.4MB floppy disks? This means you used HD (high density) floppy disks, which could hold up to 220 machine program files on it. Case in point – your machine could only handle the size of those files that could fit on those floppy disks. So even though you are using a 1GB USB stick, it will only hold whatever your machine could handle. Remember though – the goal is not to increase memory. It is to save time and money on the shop floor by ditching old technology! Want more insight on our hardware? Call (877) 611-5825 or fill out a contact form so we can get back to you when it is most convenient! Don’t have Haas or Okuma on your shop floor, but need to replace floppy drives?